Sydney, a city of Australia, capital of the colony of New South Wales, in Cumberland county, on the S. shore of Port Jackson, about 4 m. from its entrance, 450 m. N. E. of Melbourne; lat. 33° 51' S., Ion. 151° 14' E.; pop. in 1871, 75,945, or including the suburbs, 134,-758. Part of the town stands on a promontory, with Darling harbor on the W.; part occupies a narrow valley E. of this; and the remainder is on undulating ground extending S. and still further E., with extensive water frontage on the 1ST. and N". E. The greatest length of the city is 33/8 m. N. and S., and its breadth 27/8 m. E. and W. The total length of the streets is 115 m., and the number of houses 14,500. The main streets are laid out at right angles, but many are crooked and narrow, giving the city the appearance of an old English town. It is well supplied with water and lighted with gas. Public traffic is carried on by about 600 omnibuses and hackney coaches, and 30 steam ferry boats connect with the transmarine suburbs. Most of the public buildings, banks, and warehouses are of freestone in the Italian composite style. The exchange in the Corinthian, the government house in the Tudor, and the university in the perpendicular English style, are fine specimens of .architecture. 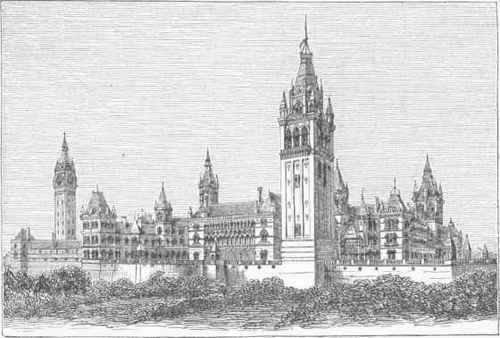 The new post office, opened in September, 1874, and the town hall, which is very large, are imposing edifices. Other noteworthy buildings are the new railway station, the courts of justice, the parliament buildings, and the treasury. There are two cathedrals, Anglican and Roman Catholic, and about 120 other churches and chapels. There are three theatres, spacious markets, and several parks and gardens. Hyde park contains 40 acres, the Domain 138 acres, and the botanical gardens, the finest in the colonies, 38 acres. Prince Alfred park, Belmore park, and Moore park (500 acres) have all been recently laid out on the S. and S. E. sides of the city. Sydney is the residence of an Anglican bishop, who is the metropolitan of the Australian dioceses, and of a Roman Catholic archbishop. Connected with the university, whose degrees confer the same rank as those of the English universities, are St. Paul's Anglican college, St. John's Roman Catholic college, a Presbyterian college, and a Wesleyan college. There are also a normal school, a nautical school, many public and private schools, a free museum, a free public library, an observatory, three daily newspapers, and twelve weekly and eight monthly periodicals. Since 1855 a branch of the royal mint has been established here. The harbor is completely landlocked, and the largest vessels can come close to the wharves; and extensive ship yards and dry docks furnish every facility for repairing vessels. The port is well defended by several forts and batteries. The entrances at Port Jackson in 1872 were 1,022 vessels, tonnage 418,164; clearances, 854, tonnage 360,735. The exports to the United States for the year ending Sept. 30, 1874, amounted to $335,465. - Sydney was founded in 1788, and named in honor of Viscount Sydney, the colonial secretary of state. It was incorporated in 1842. In 1875 an intercolonial industrial exposition was held there.